Easy Lessons and Sweet Designs for Wearing, Living & Giving. Meredith Crawford from the popular blog One Sheepish Girl (onesheepishgirl.com) celebrates creativity and vintage style in this beautiful selection of creative ideas, projects, and tutorials for crochet. 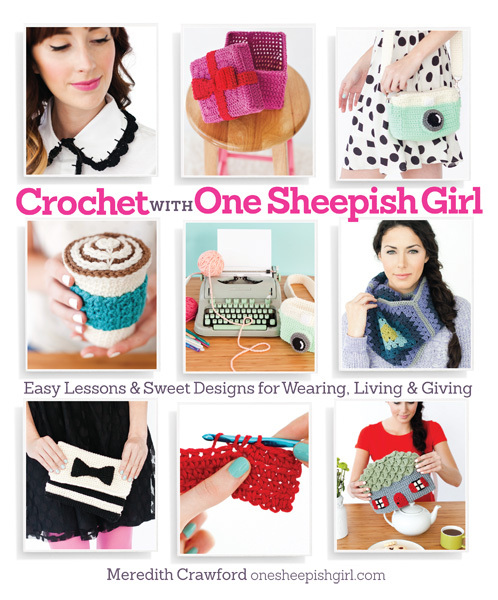 In Crochet with One Sheepish Girl, the blog's founder and editor Meredith Crawford presents a fun and beautiful collection of vintage-inspired projects and palettes with an unmistakably modern flair. The projects include a "Diana Dreamer" purse (an homage to Meredith's vintage camera of the same name), a bow brooch, a sweetly embellished blouse, a cottage tea cozy with a "thatched" roof, crochet-bordered picture frames, unique gift boxes, and delightful garlands for party decorating. The book also includes step-by-step how-tos for basic crochet stitches and special techniques.